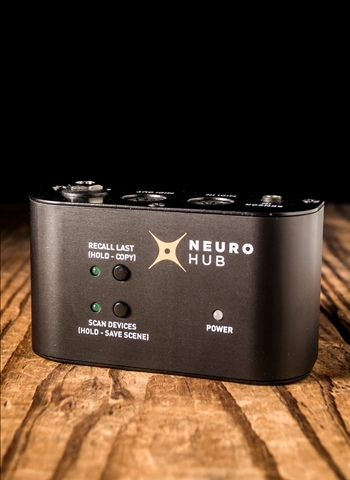 The Neuro Hub v1 unites all your One Series and Soundblox 2 pedals into a thoroughly integrated multi-pedal system. This breakthrough in effect technology introduces Source Audio’s new scene saving functionality, enabling the creation of up to 128 single or multi-pedal presets (i.e. "scenes"), each recallable via MIDI Program Change messages. Simply dial in your One Series and Soundblox 2 effects as you would any fully loaded pedalboard, hit SAVE on the Hub and your pedal settings are captured! Enjoy the power of one-step scene recall without the headache of navigating a complicated multi-effects processor. The Hub’s connections include standard 5-pin MIDI IN, MIDI OUT/THRU, passive "TRS" expression pedal input, a Hot Hand Sensor Input, mini USB port, and 5 Multi-Function outputs. Connect the Dual Expression Pedal, the Reflex Universal Expression Pedal or the Hot Hand 3 Wireless Effect Controller to the Hub and assign external control to any pedal on your board. Each scene can contain any number of external control configurations, including simultaneous Hot Hand and Expression Pedal control of multiple parameters on multiple pedals. Connect the Hub to a PC or Mac, via the USB port, for updates, saving and editing presets, and much more. The Hub Manager is the Neuro Hub’s companion software application. It offers an extremely intuitive interface and easy-to-understand graphic display. With the Hub Manager, users can create and edit scenes, name them, export/import scene files, and share them with other Hub owners. The graphics make it refreshingly simple to understand the components of each pedal board scene - simply click a pedal image to reveal a straightforward graphic display of that pedal”s knob settings and external control assignments. The Hub connects to all Windows or Mac computers with a standard USB cable.